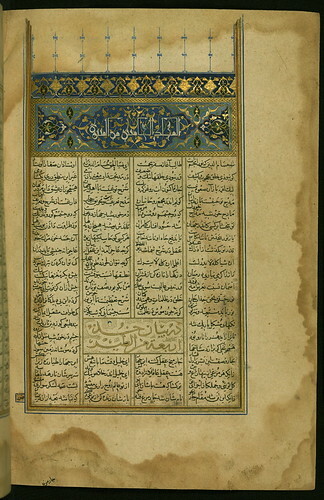 Collection of poems (masnavi), Walters Art Museum Ms. W.625, fol. 204b, originally uploaded by Walters Art Museum Illuminated Manuscripts. Floral and foliate decoration in gold. Leaf from an elegantly calligraphed and illuminated copy of the collection of poems, known as Mas̱navī-i maʿnavī, by Jalāl al-Dīn Rūmī (d.672 AH / 1273 CE). This codex was penned by Aḥmad ibn Ḥājjī Abī Bakr al-Kātib in 865 AH / 1461 CE.